SAN DIEGO, March 1, 2018 /PRNewswire/ -- MyDx, Inc. (OTCQB: MYDX), a science and technology company and creator of MyDx® (My Diagnostic), the first multi-use handheld chemical analyzer designed for Cannabis professionals and retail consumers to correlate the chemical profile of cannabis with how it makes them feel and which ailments it alleviates, sheds light on what cannabis consumers are actually buying at dispensaries across the nation and has licensed its database to a licensing partner that intends to create the industry's first Counterfeit and Popularity Indices. 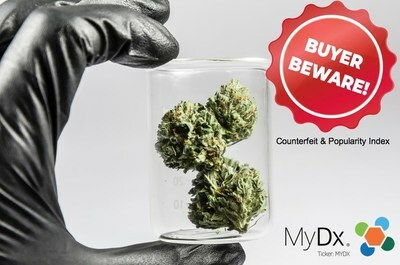 MyDx entered into an agreement to provide a licensor with access to its dataset in order to come up with a "Counterfeit Index" that determines the likelihood that a strain name doesn't tie to its chemical profile. The counterfeit index will identify and rank the strain names that have the greatest deviation in chemical profile which is often the result of intentionally mislabeling strains with names that gain extreme popularity in order to yield a greater price per gram. "Chemical formulas can be complicated and a bit overwhelming, especially for consumers new to cannabis, so our licensee intends to give a 'BUYER BEWARE' warning on various product names, which will be issued in a number of ways, including website widgets and product labelling that can be used by companies such as Leafly," said Daniel Yazbeck, Chairman and CEO of MyDx. Since popular names yield higher prices, the index plans to inform consumers to demand confirmation of the chemical profile to ensure they're getting what they paid for. Since the name may not tie to its chemical profile, more informed and nuanced consumers could equally demand confirmation of the chemical profile. As of January 1, 2018, since recreational marijuana became legal in California, all cannabis products sold legally are required to be tested and the chemical profile displayed on the packaging. The important thing to note is that everyone is different and how one person reacts to consuming a cannabis product is different to how someone else's body may react. This is the reason why it is important for everyone to track and determine what is the best combination of cannabinoids and terpenes that works for their biology and desired effect. This was the premise behind the CannaDx analyzer and App which can be downloaded for free. The same licensor is also interested in providing consumers with a popularity index associated with a chemical profile, rather than the name. As many are aware, BLUE DREAM is one of the most recognizable and popular strains out in the market; however, since MyDx determined that BLUE DREAMS differ dramatically in chemical profile, sample to sample, plans are in place to show which chemical profiles people enjoy/use the most to solve certain ailments/create certain feelings. "Right now, we are learning which chemical profiles are being used to achieve certain results, and our objective is use that data to inform users that a certain profile is being reported by the crowd for headache relief, for example," said Yazbeck. The primary goal of this index is to identify which chemical profiles are best for certain ailments and/or feelings. This, in turn, will help consumers more quickly identify profiles and will help brands better market their products. For Blue Dream, the average THC across approximately 100 tested Blue Dreams is 20.7% and the average CBD is 1.5%. The Top reported associated feelings for these strains include happy, relaxed and focused. The top reported ailments include: stress, anxiety, ADD/ADHD and others. The Biggest Lie in Cannabis: "You know what you're ingesting into your body"
With one of the largest pre-clinical databases in the industry that ties chemical profile to physiological response through crowdsourced data, MyDx insights are uncovering the truth about the cannabis you purchase at your local dispensary – you're likely buying something entirely different than the strain name on the package. For example, MyDx data shows that the "Blue Dream" cannabis strains, in general, differ by an average of 64% with respect to chemical profile - sample to sample – meaning, you're unlikely to get the same product every time. What's even more concerning is that Blue Dream isn't the only recognizable name where discrepancies exist, which demonstrates an industry-wide problem. Gorilla Glue, Green Crack, among others, have variances as high as 83%. This has significant consequences for both the recreational and medicinal users, as more and more users are seeking more acute uses of marijuana to create certain feelings and/or solve various ailments. "I want to relieve pain or be creative without going to sleep"
Thanks to MyDx's Handheld Device, both recreational and medicinal users are becoming more informed about what they put into their bodies. As a result, users are better equipped to determine what and how much to use to achieve a desired result, which, in turn, has created a whole new subset of recreational and medicinal users. Since chemical profiles affect people differently and because much of what you buy is unknown, more and more recreational and medicinal consumers are turning to MyDx and its partners to help them solve their ailments and achieve their goals. "Consumers are using MyDx's proprietary data and tools to discover which chemical profiles, NOT THE NAME, help them best to achieve their needs. People's palates are more nuanced than before as more and more people seek better tailored experiences that they simply can't achieve by relying on at their local budtender," said Daniel Yazbeck. "And it's not just consumers who are a part of this trend. MyDx has licensed its dataset to a company looking to provide the industry's first Counterfeit and Popularity Indices that will eventually go on cannabis product packaging." To learn more about MyDx, please visit meetmydx.com. To learn more about the MyDx Data Analytics Division, please visit www.mydxlife.com/dataanalytics/. MyDx, Inc. (OTC:MYDX) is a chemical detection and sensor technology company based in San Diego, California whose mission is to help people Trust & Verify® what they put into their minds and bodies. The Company's first product, MyDx®, also known as "My Diagnostic", is a patented multiuse hand-held chemical analyzer designed to help consumers and professional test for pesticides in food, chemicals in water, toxins in the air, and the safety and potency of cannabis samples, which is the initial focus of the CannaDxTM application. CannaDx users have submitted over 40,000 crowdsourced datapoints revealing the chemical profile of the cannabis they are consuming and how its making them feel, which feeds a data analytics platform, a SaaS business, as well as the biopharmaceutical division of MyDx. The company is committed to addressing areas of critical national need to promote public safety, transparency and regulation in the various markets we serve and hence its more immediate mission is to continue to develop smart devices as part of an ecosystem that crowdsources consumer generated preclinical data to drive innovation in the cannabis industry. For more information, please visit www.mydxlife.com.